Excellent adhesion and subsequent layer bondability. LED/UV Base coat allow for a smooth foundation and excellent bonding capabilities to be achieved. 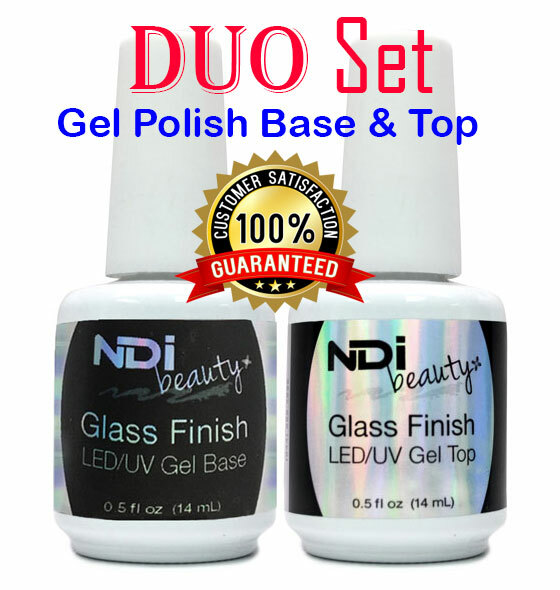 fills ridges to provide a smooth foundation for subsequent layers NDI Beauty Glass Finish LED/UV Gel Top is a sealer top gel designed to create the ultimate finish with your Soak Off Gel Polish or artificial nails. It creates a high shine that will not dull, chip or peel from Soak Off Gel Polish. Protect the life of your nails with a gloss enhancing gel top coat. This top coat lends an added benefit of durability and high shine. More Profitable: NDI Beauty Glass Finish LED/UV Gel Top delivers unbelievably affordable services. And, it removes at a fraction of the cost of other color gels.